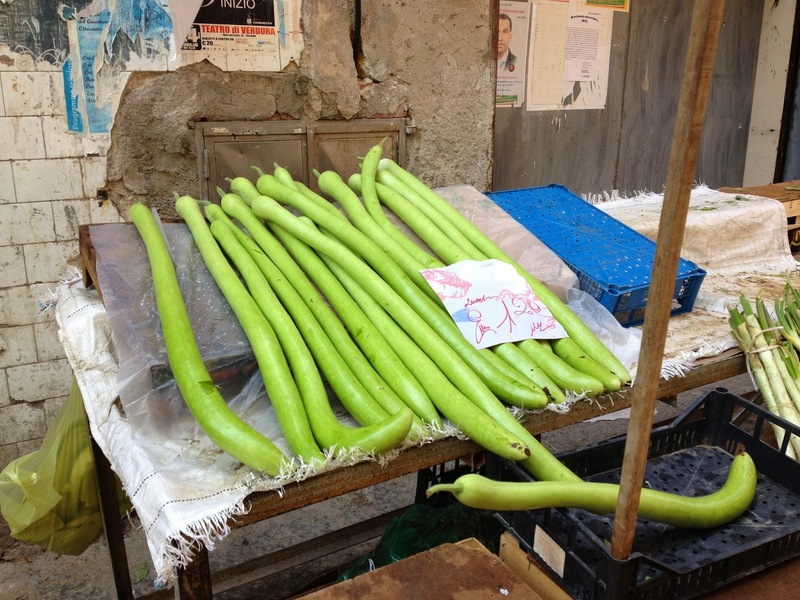 Cucuzza squash in the Mercato di Capo in Palermo. 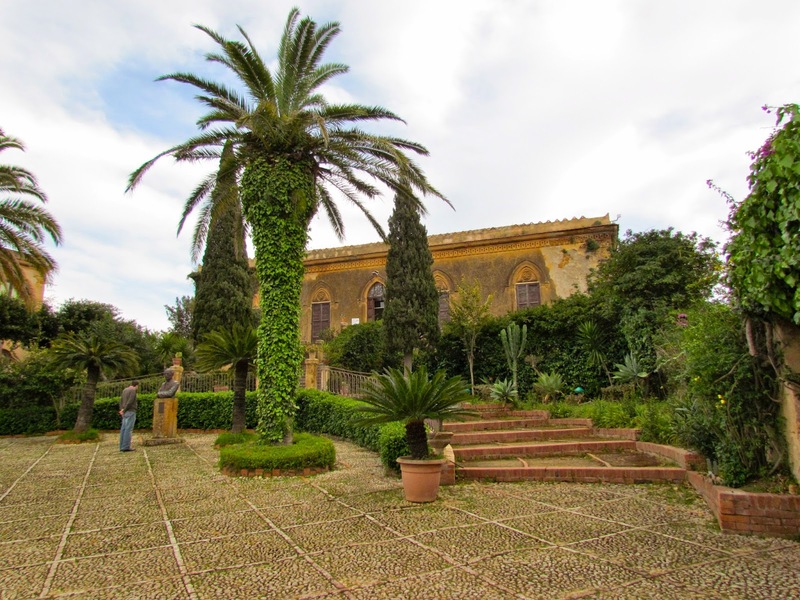 We’d planned to drive into Palermo twice during our time in Sicily but a food poisoning incident put an end to that plan two days before we were scheduled to fly to Rome. What’s worse is that I’d intended to spend that last day at the botanical garden but all I could do was vow to return. What’s a girl to do? Seriously. This meant that we had to leave the island with only a few memories of the chaotic città di Palermo, but at least we saw the catacombs and il Mercato di Capo. My other hope all along had been to visit a market in Palermo and somehow we landed at one of the largest quite by accident. 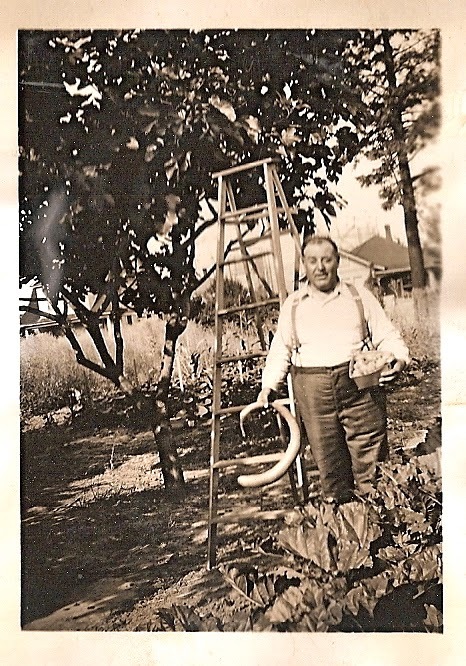 My great-grandpa Frank Amato with a cucuzza he grew in his garden in SE Portland. Since it’s much colder here in Oregon than in Sicily I know this was a triumph for him. I’m sure this photo was taken to always remember this accomplishment. 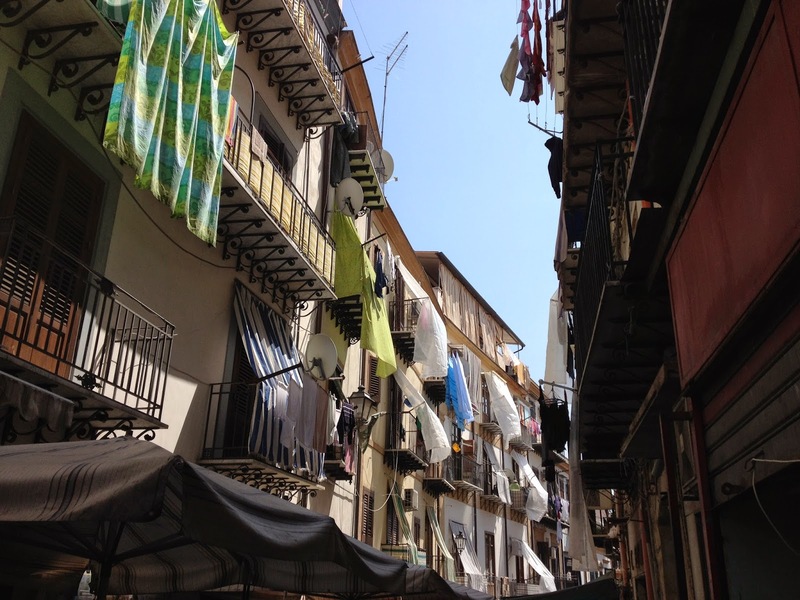 All I could think about that day in Palermo was my family. Everything I saw as I looked around brought color and life back into the black & white photos I’d grown up seeing. 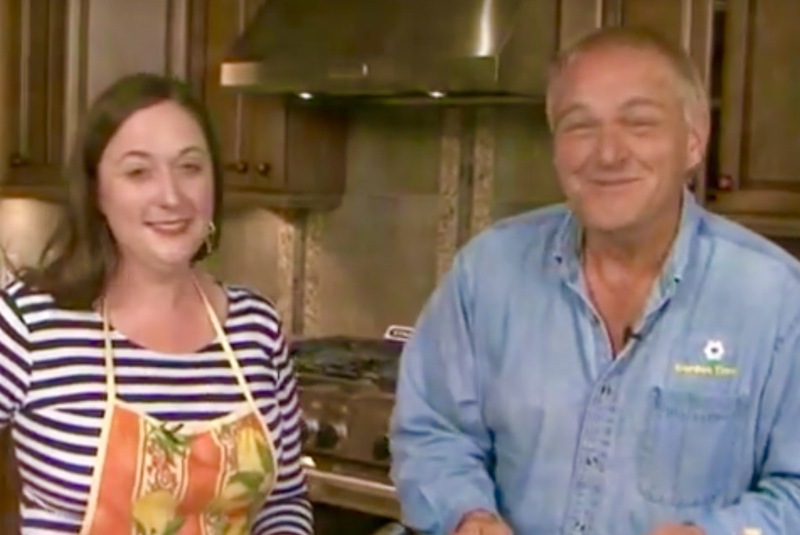 This awakening of snapshots invigorated me and although I walked beside my husband, I knew then as I know now that this experience was my own and I embraced every awkward moment of it. (Honestly, he’d bought a platter of pastries and was reliving his own Italian childhood as we walked through the market that day.) There we were walking together reliving our own memories yet his were real and mine were only the half-imagined stuff of stories, old photos, and dreams mixed with raw emotions. I wanted so badly to be a little girl walking beside my great-uncle Charlie (holding his hand), or to be with his best-friend, cousin Joe. It felt strange to be in Sicily alone. Yet, that was the beginning of an ongoing chain of epiphanies for me as I walked through the market. Any American with a strong tie to another culture can make choices—either cut their ties and let the past remain the past or inject new life into it. I’ve always straddled my Italian-American identity and dealing with being bi-cultural in Oregon in the 1980s was not easy. Countless times Americans have told me I wasn’t Italian enough to be Italian and they were wrong. Children should never have to grow up defending their identity. They have no idea how painful and damaging those words were to me. Besides, Italians don’t quantify their identity, they qualify it. That’s why I have a blood right (jus sanguinis) entitling me to Italian citizenship. I’ve been given that choice by my bloodline. In Italy it doesn’t matter how much Italian blood you possess, what matters is what you do with the heritage that’s been passed on to you through birth. As a girl I’d looked at photos with family members and I’d been told that these were a part of who I was and of my identity but I know now the damage that can do over time. I was always confused because those photos weren’t of my life in the 1980s with a mother who wasn’t in the least bit Sicilian and with two brothers who in no way cared about any of this. We’re the American generation that really is able to choose to be called American but I’m the only one of my siblings who’s chosen to remain hyphenated. This is what happens in bi-cultural and bi-racial families. Individuals must be allowed to decide who and what they’re going to be and the family fabric will change. I wish I had siblings like me, but I don’t, and honestly, we’re not that close. For me it’s always felt like a cultural rift or divide but it’s difficult to say. Instead of dwelling, I’ve lived my own independent life and have chosen to remain Italian through my marriages and I’m pleased now to have an Italian mother-in-law. It’s the way my life is, has been, and will be. I’m happier now than I’ve ever been. I love to cook and garden. I have an undying love for produce and fresh food. And when I wake up I drink my coffee and spend a lot of time everyday thinking of making new dishes for the many friends I invite to eat at my table. 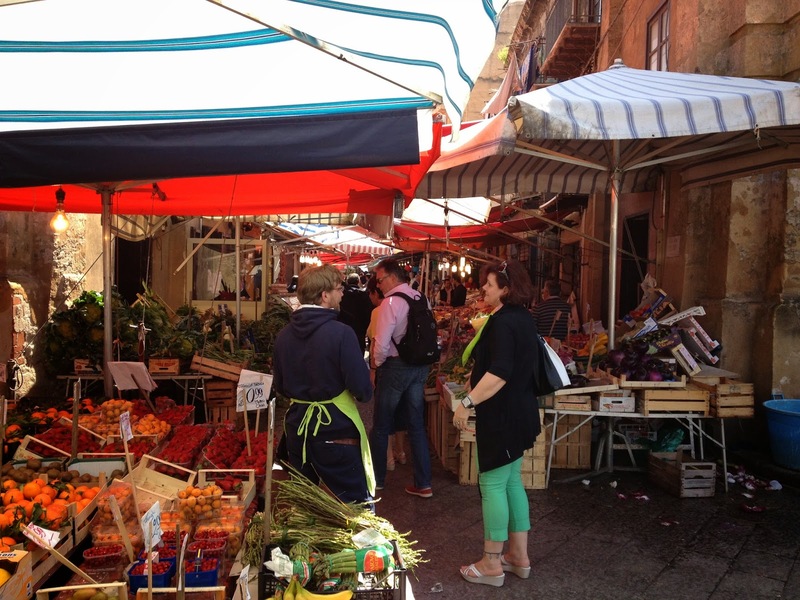 Seeing a market in Sicily one day can make all of this happen if you’re the right kind of person in need of that kind of emotional catharsis. I’ve been crying out for that experience for so long and it’s sad I had to wait for so long and travel so far but I’m a better person now. This mosaic floor depicts the bountiful harvests available on the island during the era of the Roman Empire. Many of the orchards had been planted by the Greeks centuries before so there was already an agricultural system in place. Leading up to that epiphany in the market we’d spent the day before driving from Termini to the Villa Romana del Casale in the interior of the island. 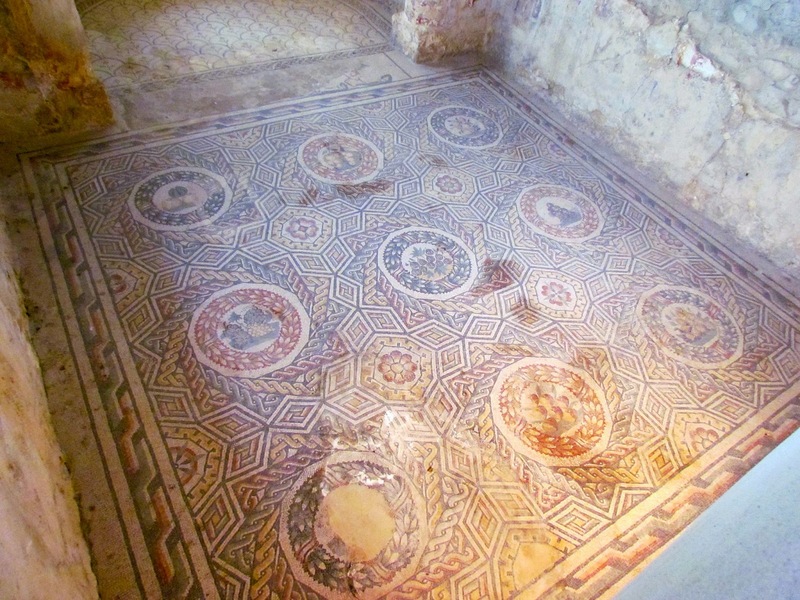 The villa contains the largest collection of Roman mosaics in the world and is an UNESCO World Heritage Site. 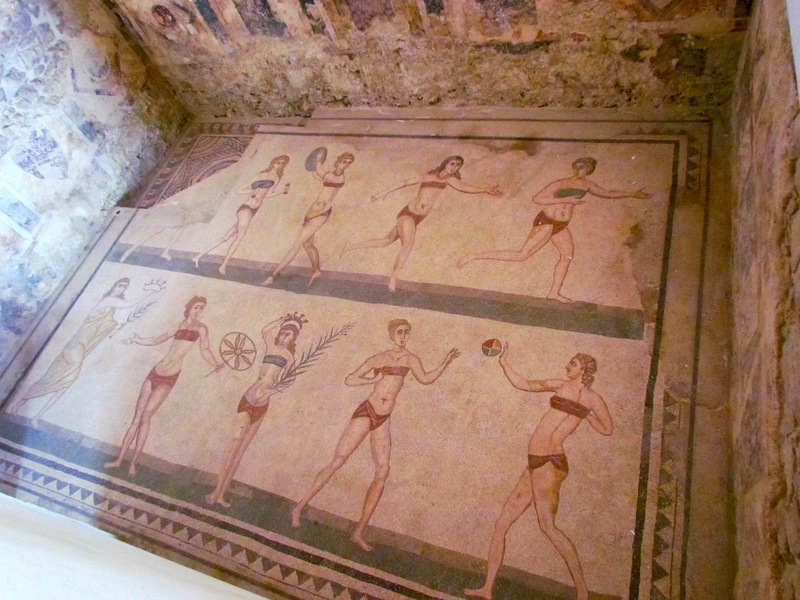 The “bikini girls” is by far the most famous mosaic work in the complex. Seeing it in person was a highlight of the trip for me. It was absolutely nothing like I had imagined. The figures are quite large and they’re more real when seeing them in person. The shading on the leg muscles was much better than I’d remembered seeing in books. I also noticed all of the botanical bits and pieces as we walked through the entire complex. Recounting what I knew about the meaning of each plant as we looked at the mosaics was interesting to John. Although he has a Master’s degree in history, with an empasis on the Italian Renaissance, he’d never read much about ancient Rome and Italy. It was fun sharing with him. 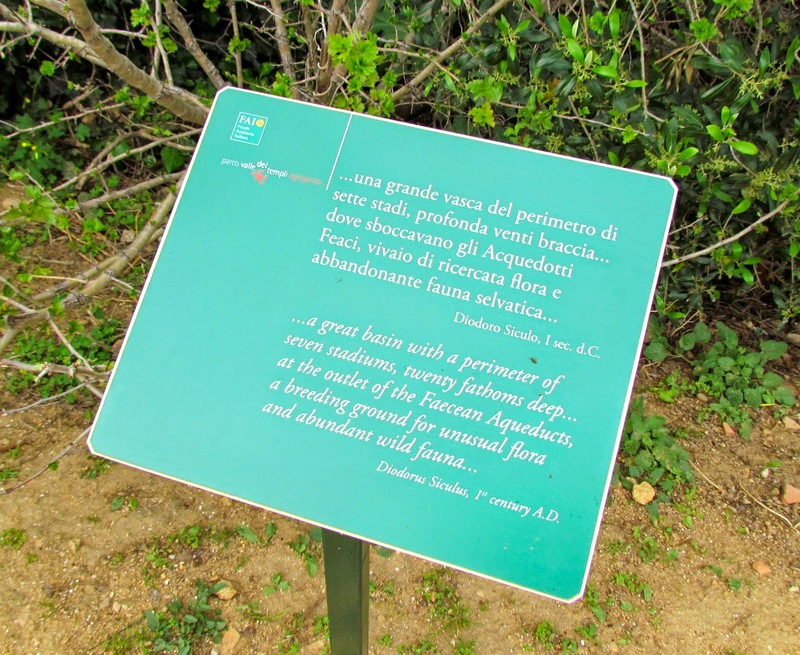 Nowhere in Rome will you see anything quite like the Villa Romana del Casele. It’s huge and very well preserved. Walking on walkways overlooking all of the rooms and floors was a brilliant design plan too. You see so much! It really made me long to return to my days as a student of art and landscape history. I’d once worked hard to specialize in ancient art, philosophy, and history. Using my knowledge while there though really enriched the experience for me. John left knowing a lot more about Italy’s flora and the history of it too although we both still have so much more we want to learn. Driving several hours though the countryside, stopping in the road for a shepherd and his flock of sheep, and chatting all day with John about his impressions of the place made for a dream-like day. We still had one more stop though. 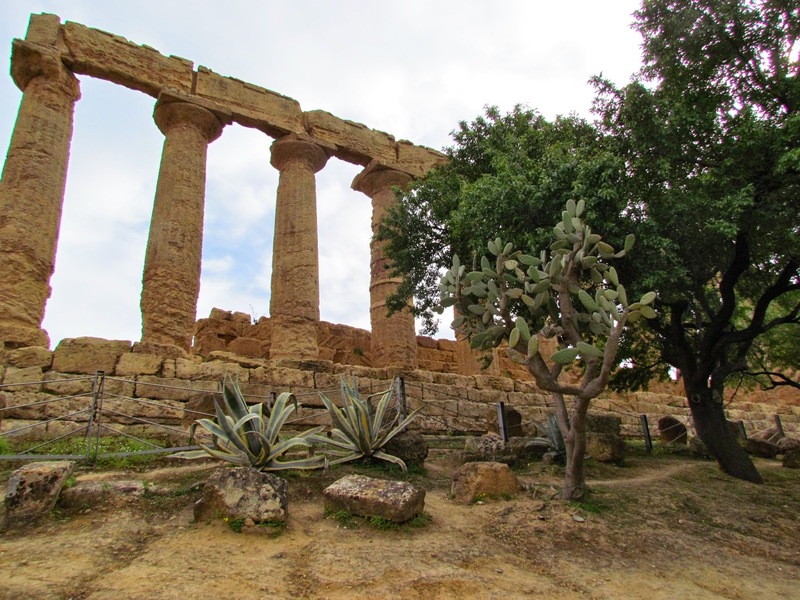 We drove for a few more hours to Agrigento, on the southern coast of Sicily. This is where you’ll find the Valle dei Templi. In addition to being a national monument in Italy, it’s also one of the best places in the world for Ancient Greek architecture. The temples are above the valley, along a ridge. As we drove into town they were difficult to miss. The view from the road below was truly breathtaking and I was left speechless. I’ve had few spiritual moments in my life, but that afternoon was truly a spiritual pilgrimage for me. Yes, there was an attached garden too but its gate was closed. And it was so lovely that in the middle of the ancient Greek temples, catacombs, and necropolis you’ll find this humble home built by an Englishman by the name of Hardcastle who came to “save” the temples. I will not get onto the topic of what other Europeans have done in Italy in regards to preserving the history of the ancient and artistic heritage we all seemingly share, but I’m certainly of the opinion that this lovely eyesore should have been built somewhere else—oh, and that England should hand back the Elgin Marbles to Athens. This should probably make my sentiments and opinion quite clear. Here I am standing in front of the Temple of Concordia. It is sad to me that John does not share my interest in the ancient world, but he has other things to buoy his interest up north and happily we ended up learning a lot from one another. Life is a funny thing and we all need our own raison d’être as the French like to say. I think it’s important that we each find our own and respect others’. There truly are so many options out there that make life truly worth living. As we walked back to the car, I spotted this sign and glimpsed over to the area it was describing. Only exhaustion at this point kept me away. I wanted the signs to tell me more—so much more. But my body was in no mood to make the descent. 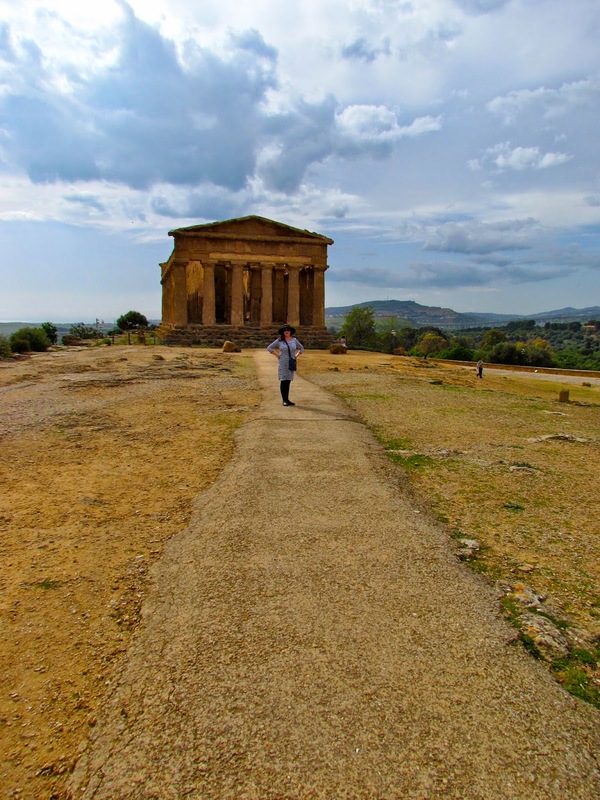 I definitely need to study more and return refreshed and prepared to Sicily. We drifted from that ancient universe to Palermo and then to Cefelù after several trips into Termini. The days truly all blend together now. That evening in Cefalù I purchased seeds at this shop for my mother-in-law and myself and it was a bit like a candy store for me. All the necessary new Italian vocabulary I needed to communicate with other gardeners was there on the shelves. Then I ate something that gave me food poisoning and the trip took a turn. John and I after a day of bed rest due to food poisoning. Our nausea made walking difficult but we made it down to the common area at least. 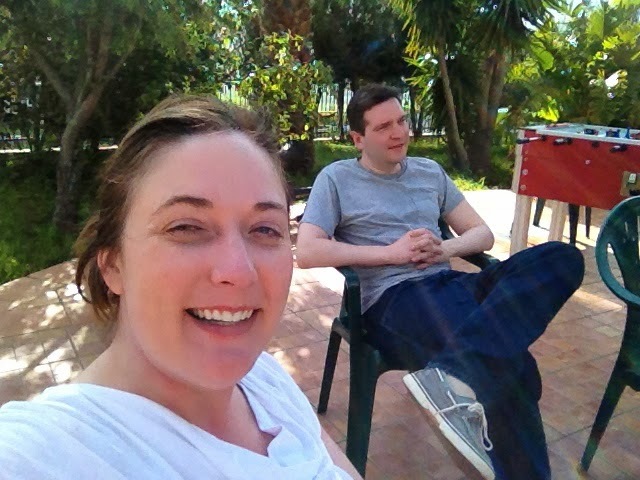 Our last full day in Sicily was spent recovering from the food poisoning. John only had three bites of the aranchi rice ball that made me so sick so at least he empathized. We were both unable to move much that day so we just processed what we’d seen so far and John and I talked about what was yet to come. 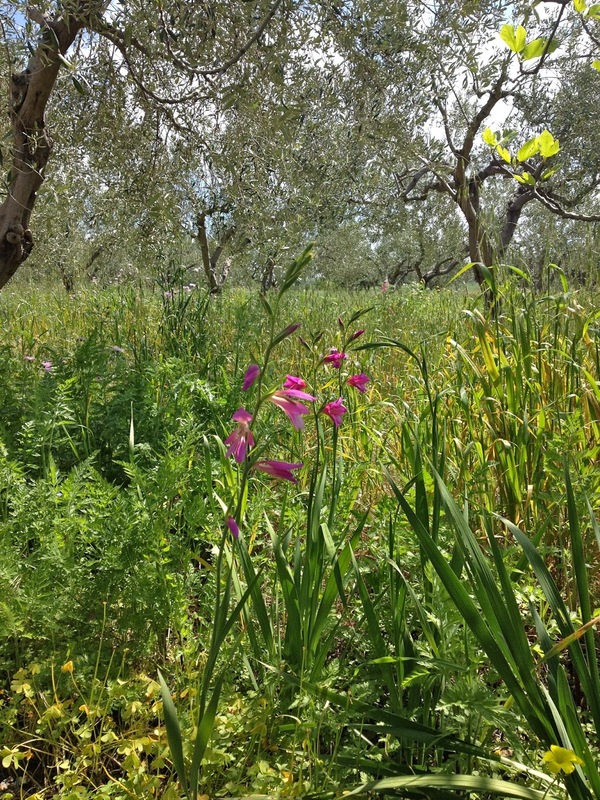 Wild native Gladiolus italicus growing in the olive orchard. 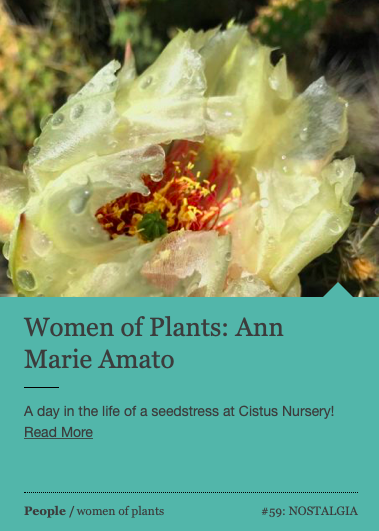 I wandered around where we’d been staying to take more plant pics and after John returned to our room, I sat with the Sicilian tourists at the restaurant below our lodgings and soaked up their noise as I wrote to friends back home using the Wifi connection. The day-trip tourists ate daily at the restaurant and then danced to loud music and talked to one another. 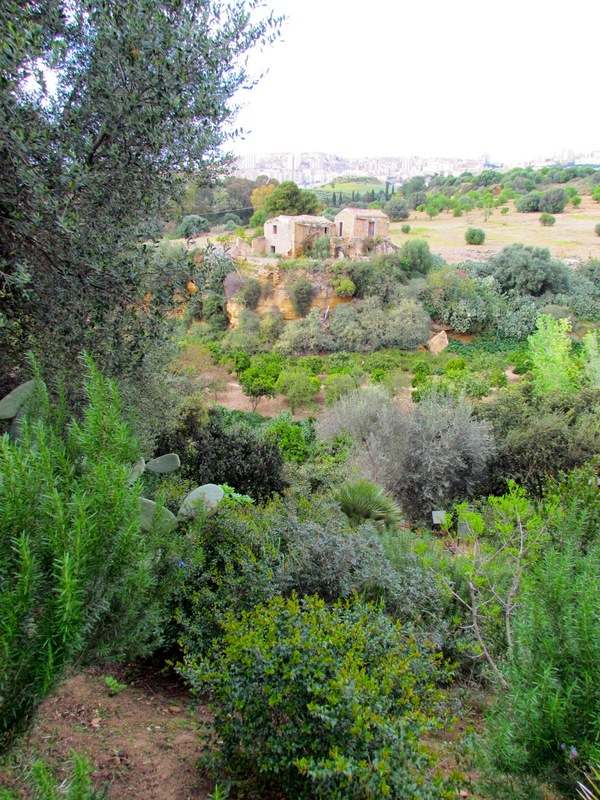 (Yes, Sicilians love agroturismo too and they’d all paid to take a bus to artichoke country to spend time basking in the harvest.) We were largely ignored as outsiders, but that last day it changed for me. The day before I’d heard an old man on the patio playing traditional Sicilian music with his mandolin. My heart had seriously skipped a beat. That day he was back. The tourists piled onto the buses and only he and I were on the patio. He hobbled over to me and sat down speaking Sicilian dialect as he slowly crossed the distance. Looking right into his eyes, I pieced my words together carefully. I told him in broken Italian I understood him but did not speak well. He shifted to Italian. I pointed at his mandolin and said to him (in broken Italian), “the music of my great-grandparents”. He asked me if I was Sicilian. I said yes. He asked me my name. I said Amato because that’s what a Sicilian means if he’s asking about your name. He wants to know the name of your family. He asked where my family was from and I said Termini. And that’s the key to opening up a Sicilian. He smiled a wide smile and his eyes lit up. Then he asked what my mother was and I said “American”. As is usual, he told me that was ok and then he played music for me and sang. He apologized for his playing and blamed his age. He told me he lived nearby and was widowed and alone. He walked to the restaurant when he could for the exercise. Then we talked about Oregon. He was shocked that Sicilians so long ago had moved so far away. This was not the first time I’d heard this either. I didn’t have the heart to tell him that they’d avoided other Sicilians in the United States intentionally. At least that’s what I’d been told by a relative not long before he died. We never had spoken much about it when I was a kid, but he told me because by that point it no longer mattered. What’s done is done. The view from our bed. The doors to the room are glass but then there is a second lockable set with louvers. 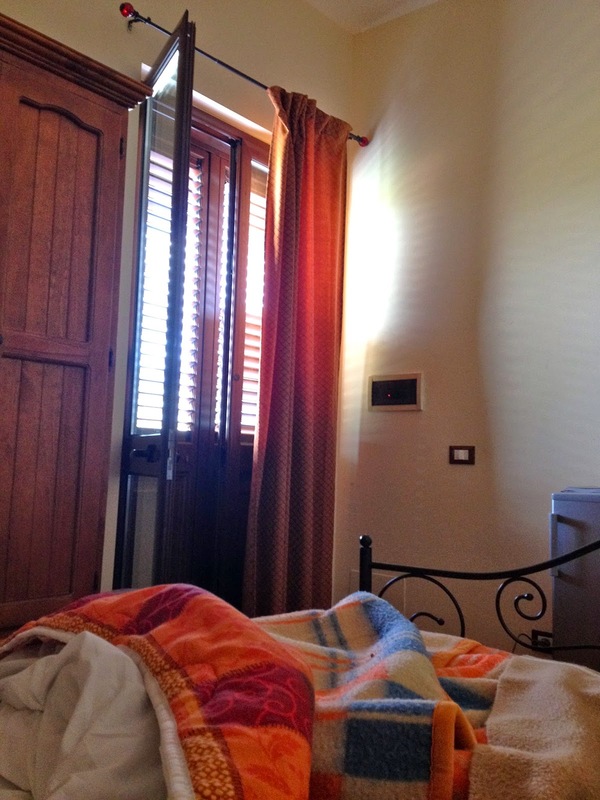 It’s a great way to manage the Sicilian sun and heat. This is part of my American story and I’m proud of it. My Sicilian family thought differently and I’m happy they landed in Portland. It’s also been said they came here for the soil. They wanted nothing more than to be able to grow vegetables in peace and to prosper beyond poverty. Unlike many other Italian emigrants, they saw success early on and their sacrifice paid off. Driving through Palermo in the dark on our way to the airport I recalled having seen the bleak monument near the waterfront only days earlier dedicated to AI CADUTI NELLA LOTTA CONTRO LA MAFIA (those who’d fallen in the fight against the mafia). I thought of the judges who’d been blown up along that same road. I thought too of the brave Sicilians participating in addiopizzo. Many of them are of my generation and I know that if I lived there I too would be in their ranks. I abhor the glorification of organized crime in any way, shape, or form. The commodification of this way of life feeds on the glorification of interpersonal violence and it’s not what Sicilian culture is about and I’m ashamed of the ignorance of those who play into these stereotypes. 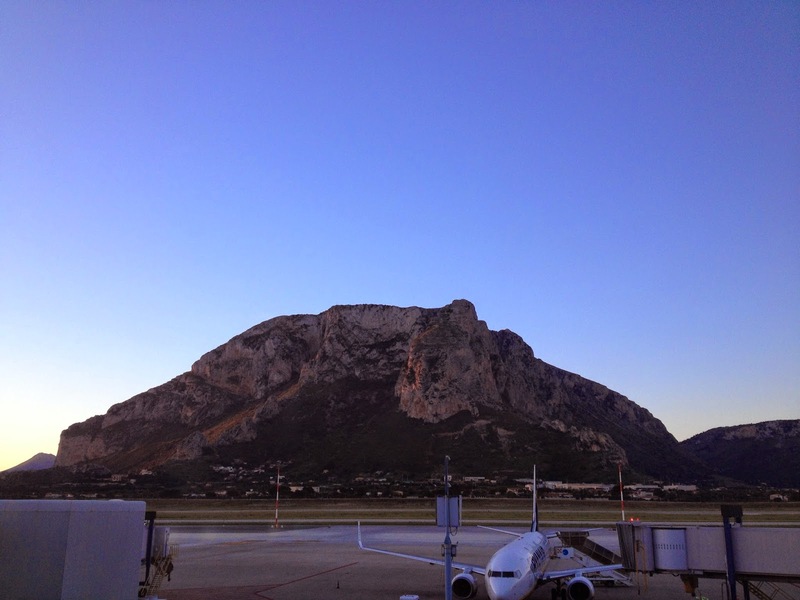 Leaving Sicily that Friday morning was very difficult for me. I’d only just started watching as something inside of me had germinated and began to grow. At least whatever it was was going with me. When the wheels of the plane lifted off, I felt an emotional tug in my gut. I did not want to leave but I left with my eyes wide open for what felt like the first time in my life. A very enjoyable post! Except for the food poisoning part. Indeed, what Alison said. Keep them coming! 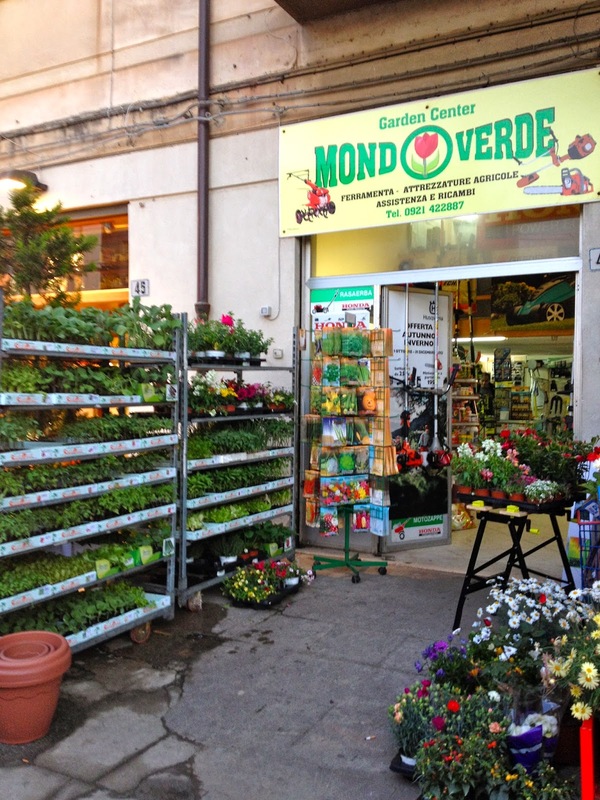 Oh and I noted the words “Garden Center” on the sign above “Mond Verde”…what's up with that? Your pictures from this trip are beautiful, and it sounds like quite an experience. My husband and I went to his family's hometown of Acuto, Italy about two years ago. It was a very emotional trip for him and had a huge impact on how he sees himself. All the best to you, on your amazing adventure! Oh, that was awful. I missed the botanical garden!!! At least we're already looking into more things we can do when we return. Gotta get back there for my plants! Thanks! From here on there will be more and more plants. As for the sign, the town is VERY tourist friendly and I'm sure there are foreigners living there. Thanks for your comment. It means a lot to me to hear I'm not the only one. Seems you learned much and found more to search out in the future. Love seeing all the areas you checked out and your stories about the people. Sorry you were down for part of the trip. 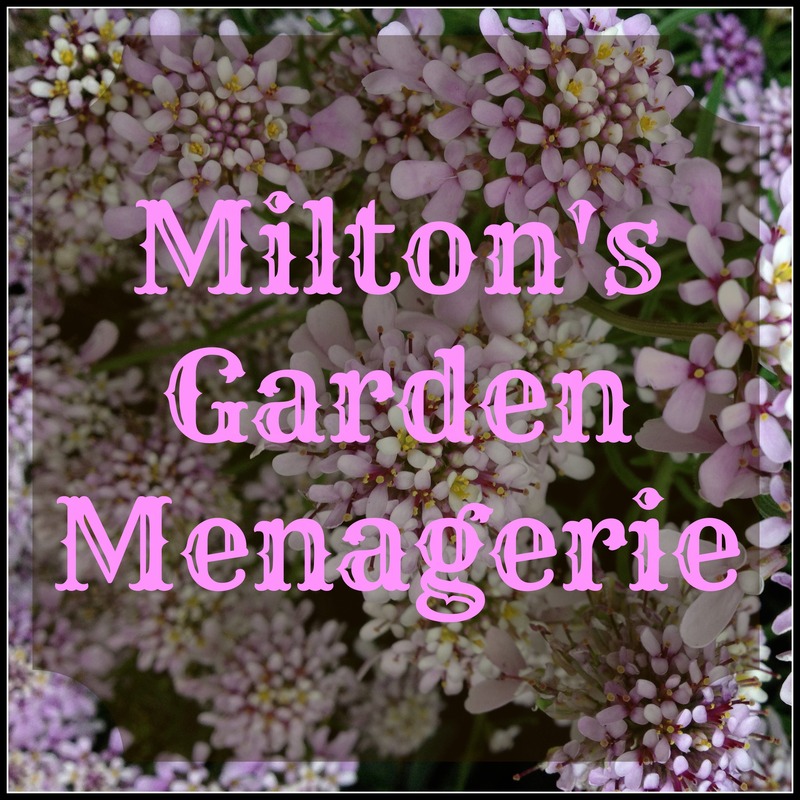 I enjoyed reading this post, mainly because I like to be shown other places, but I also liked hearing about your personal journey. Thank you.